ISBN 9790006542055. 31 x 24.3 cm inches. Key: Key: c minor. Text Language: English/German. Preface: Hartmut Hein/Mario Aschauer/Jonathan Del Mar. The ,,Pathetiquemarks the beginning of the publication of all Beethoven piano sonatas by Barenreiter in scholarly-critical Urtext editions. This Sonata in C minor was his first large work in this genre and a prime example of the late 18th century sonata. To this day it remains a source of fascination with its ardent pathos and emotional coherence. While first sketches probably date back to 1796, Beethoven did not complete the sonata until 1798/99, shortly after his string trio in C minor, op. 9 from 1797/98. He published the work in December 1799 in Vienna. 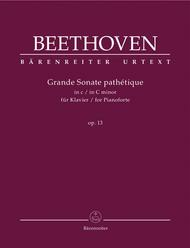 The Urtext edition of this famous sonata edited by the Beethoven expert Jonathan Del Mar remains faithful to the sources and reflects the latest research. With its clear print and practical page turns, it will appeal to advanced piano students, pianists and teachers. It includes a historical foreword, a detailed critical commentary as well as informative notes on performance practice. 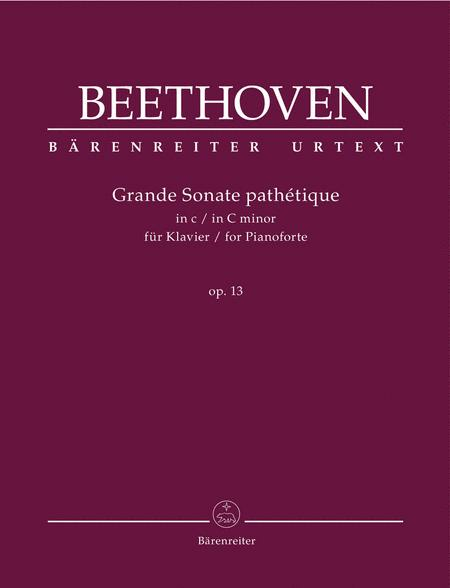 It doesn’t take much to recommend this very well-known sonata of Beethoven’s. It has been in the concert repertoire for as long as it was written. It is a challenging piece to play up to tempo, but is worth the effort. I recommend this highly.